Behold the crown, the throne, the nations bend! Ah, no! fond mother, no! behold Him die! 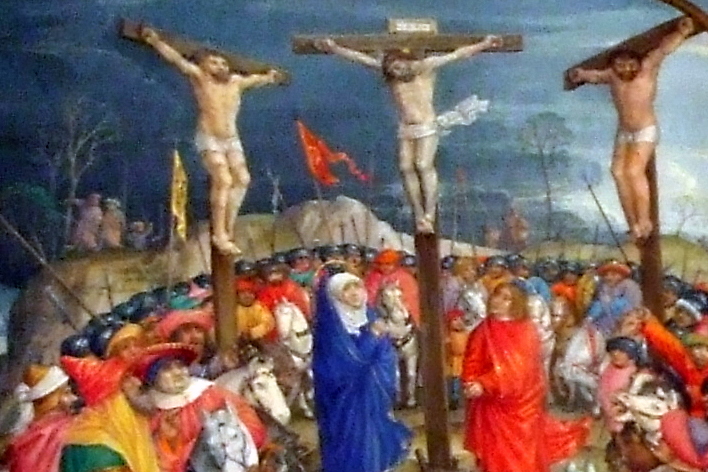 According to the Bible, Jesus hung on the cross for about six hours. A lot happened that we don’t know. We know that crowds of people came out to see him, drawn to the tragedy and ugliness. The ones who orchestrated his death came to taunt. Those jealous of his popularity came to gloat. Some of his followers came because they could not accept his coming death. And his mother, Mary, came because she could not stay away. What else would she do? Sometimes darkness has its hour and there is nothing we can do to stop it. 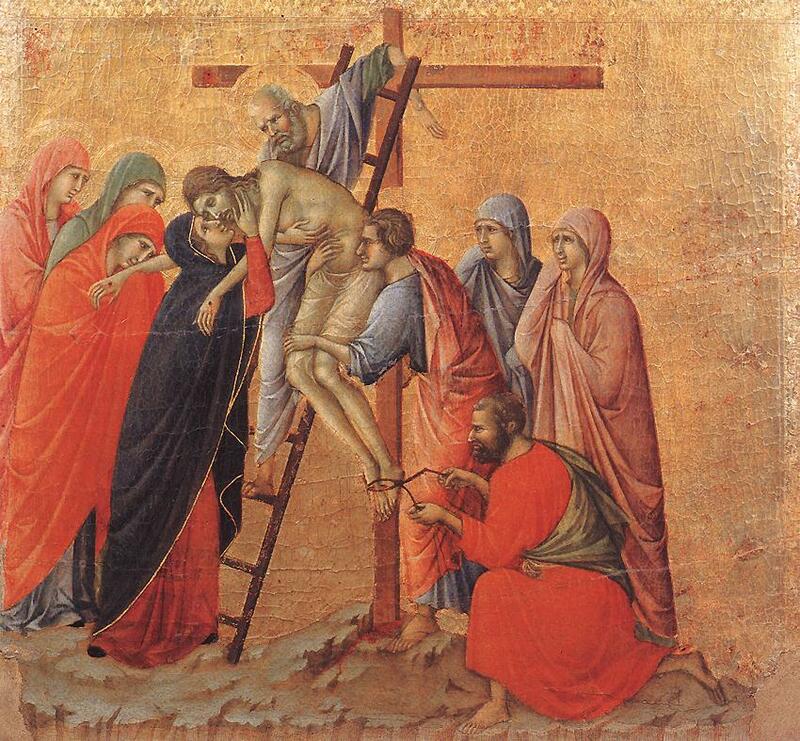 In his horrible pain and weakness, Jesus sees this loyal band of four near his cross. In his agony, he is aware of their pain. He looks upon his dear mother, her heart breaking, and gives her one last promise: Woman, behold your son … Mother, consider this boy next to you as your son. And he turns his gaze to the beloved disciple, the one who had traveled all over Palestine with him, who had shared the boat when Jesus calmed the sea, who had seen Jesus bring their friend Lazarus out of the tomb, who had shared a joyous meal with him a few hours before, and Jesus said to him: Behold your mother … Dear trusted friend, consider this woman to be your mother. And from then on, John took care of Mary as he would he would have taken care of his own mother. But there are things here that are hard to understand. We can see why Jesus wanted to see to the care of his mother in the face of his own death. She was a widow, and he was the oldest son. It was his responsibility. But why would he entrust her to John? Jesus had four brothers, and it is likely that all four were in Jerusalem that day. Some of them may have even visited the cross. Why not his brother James? Why not his brother Joseph? Why not his brother Simon? Why not his brother Judas? Why not? We should remember an earlier story, when Mary and the siblings tried to take Jesus home. He did not repudiate them, but he made a statement that expanded our understanding of family. He said that all who did the will of God the Father were God’s true children, his brothers and his sisters. Even on the cross, Jesus looks forward to the church, the new community of brothers and sisters. The Bible speaks of Jesus as our elder brother, the first of many new children of God in the new kingdom. The church is not about structured hierarchy, or control, or vying for power. It is not about lines of authority, or chain of command, or unquestioned leaders. It is about brothers and sisters living their lives in community. It is about fellow believers working together to serve God and enrich their community. It is about honoring our elders as our mothers and fathers. It is about loving our youngsters as sons and daughters. In Ephesians, Paul advised husbands to “love your wives as Christ loved the church.” How much did Christ love the church? Paul said, “he gave himself up for the church.” He went to the cross for the church, for his mother, for his aunt, for his friends, for you, for me. He loved us with a great and abiding love! BTW: I am leading the Good Friday service tonight at 6 pm at Calvary Christian Church in Bellevue Nebraska. All are welcome.